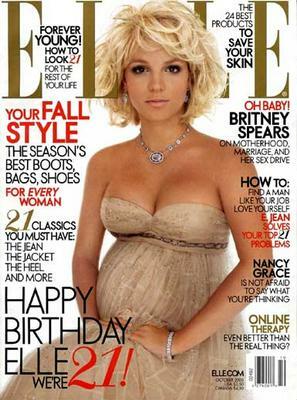 Brit-Brit is about to deliver her baby via C-section any day now, so it's fitting that she graces the cover of October's Elle magazine. People magazine will inevitably buy the rights to her baby photos as they did with her wedding and baby shower, so we were happy to hear an actual interview took place. Brit-Brit said she didn't really understand Kaballah but it's okay. The interviewer also asked our girl about K-Fed and his previous baby momma, whom he left when she was pregnant. Brit said that wasn't an issue because she loved him. And we are amazed when people label her as less than intelligent. She is effin' brilliant.